Nancy Arnold sits in the living room of her Guilford home, near the end of Whitfield Street. She had to evacuate during Hurricanes Irene and Sandy. A day after Hurricane Sandy hit, Nancy Arnold waded down her basement stairs and saw five feet of storm surge partially submerging her furnace and hot water heater. Arnold has lived in her house near the end of Whitfield Street in Guilford since 1962. She and her family evacuated to a local community center for six hours during the worst of Sandy’s tempest. Evacuations have become commonplace in her neighborhood, she said. A year prior, during Hurricane Irene, the family also packed their bags and spent the night at the center. After the Sandy cleanup, Arnold hired a contractor to install a new furnace that hangs from the ceiling, about 5 feet above the floor. 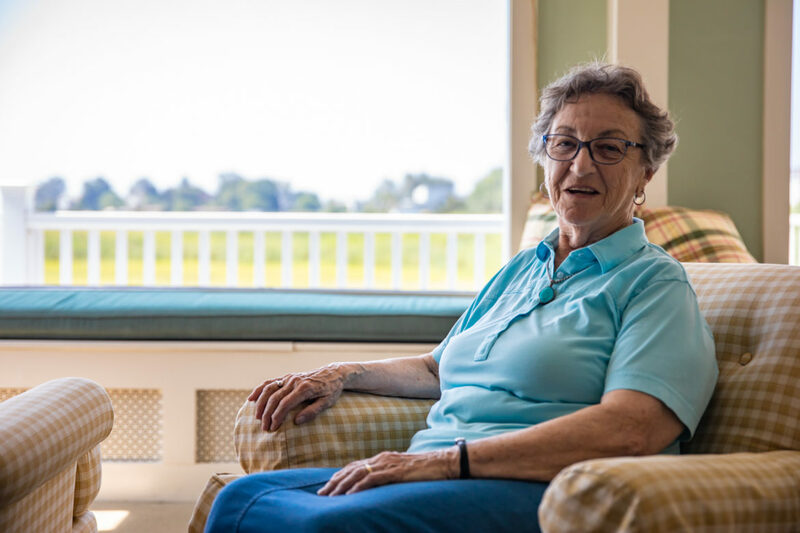 For the past several decades, Arnold has watched the tide creep deeper into the marshes that ripple outside her living-room window. Guilford’s coastal neighborhoods, like most of the shoreline, saw the future arrive with Hurricane Irene in 2011. In a century, climate change and a rising sea level on Connecticut’s coast have brought more frequent and devastating flooding during storms. The flooding destroys property, something people hear about immediately. But it also harms people’s health. After flooding, mold quickly multiplies into fuzzy blobs on walls and furniture. When people try to clean up, they breathe in airborne microbes that can trigger breathing problems, skin rashes and infections, mucous membrane illnesses, and problems in internal organs, according to fungal scientist Eckardt Johanning and his colleagues, writing in an article in Environmental Health and Preventive Medicine. After floods, mold quickly multiplies, and exposure to it can make you sick. Health researchers say that residents should view floods as hazardous to their health and doctors need to beef up their training to recognize flood-related illnesses. “If you live in an environment that is likely to see severe wet weather, it’s good for your doctor to consider if you might have health concerns from exposures after a storm, or from being in a chronically wet environment, when you go in for your yearly exam,” Schenck said. This little-discussed public health threat—exposure to mold—is rising slowly into the public consciousness. Nuisance flooding has increased on the United States coasts, and it will increase dramatically after 2050, or about the time that today’s babies will be young adults. People who live near water now live more and more in water. Adam Whelchel, director of science for the Connecticut Chapter of the Nature Conservancy, has worked on coastal resilience planning with dozens of municipalities. “There’s a whole lot of emotional stress that goes along with living along the coast,” he said. Around New England, most coastal areas have been inundated several inches over the past century. Bridgeport’s sea level has risen nearly 1 foot, and New London’s slightly less, according to the National Oceanographic and Atmospheric Administration’s (NOAA) calculations. The yearly increase is almost 3 millimeters. In March, the Connecticut Institute for Resilience and Climate Adaptation at the University of Connecticut released a report predicting increases of another 20 inches by 2050. Major areas of the coast will flood regularly in the future. The red line in NOAA’s map indicates land currently subject to flooding at high tide during rain or a storm. High-tide flooding along the nation’s coastline has increased 300 percent to 900 percent in the last half-century. 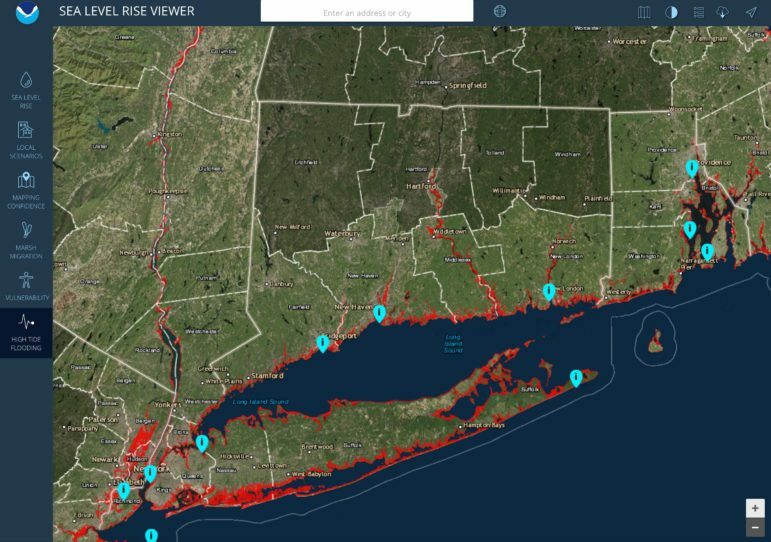 NOAA’s map of projected high-tide flooding can be zoomed to street-level detail for any town in Connecticut. A perusal of the state shows that inundation by floods will cover large swaths of Guilford south of I-95, and large areas of Madison, Bridgeport, Middletown, Old Saybrook, Haddam, Hartford and Stamford in the future. Buildings in the floodwaters’ path will be prone to mold and all that mold signifies. All molds are part of the kingdom of fungi. Scientists haven’t yet identified most fungi that exist—90 percent or so, said De-Wei Li, a research mycologist at the Connecticut Agricultural Experiment Station’s Valley Laboratory in Windsor. Scientists who study fungi spend much of their time simply identifying species. The hundreds of molds scientists have identified in this part of the world can trigger allergies like asthma and skin reactions, and some of them contain mycotoxins or volatile organic compounds (VOCs) in their spores. Mycotoxins and VOCs can cause serious diseases or reactions when ingested, when they come in contact with skin, or when someone breathes them in. The microscopic spores penetrate deep into the lungs. 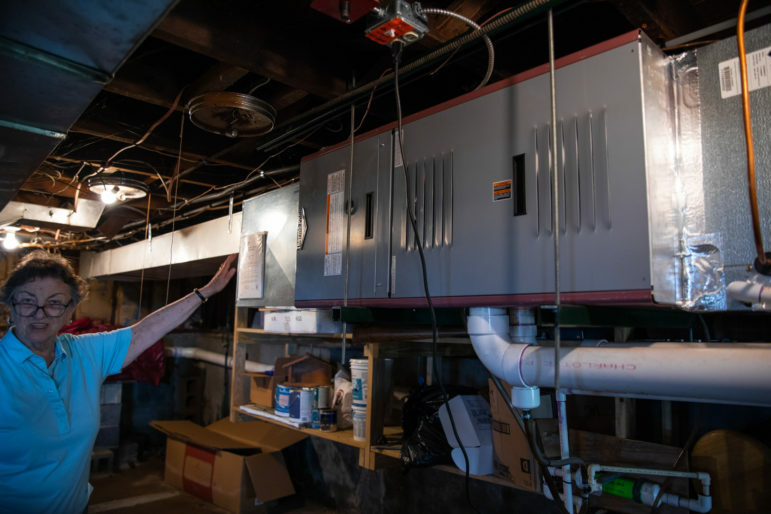 The furnace in Nancy Arnold’s home is suspended from the basement joists to prevent potential flood damage. A month after Sandy hit in the Northeast, scientists collected samples of mold from houses in Brielle and Manasquan, New Jersey. They found 36 types of mold, including six that killed flies in the lab. 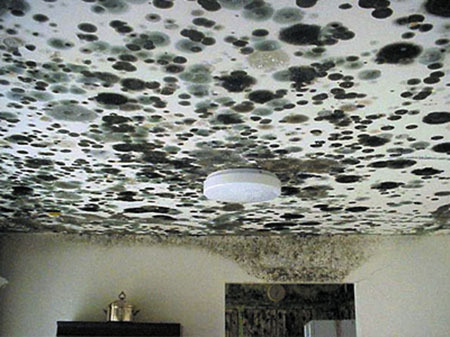 Molds found included Aspergillus niger, which the CDC reports can cause lung infections and allergic reactions; Aspergilloma (fungus ball); and the most common found in damp or water-damaged structures, Penicillium chrysogenum. The presence of mold also indicates a whole soup of biological materials, including bacteria. If someone sees mold growing inside, they are witnessing a risk to respiratory health, Schenck said. She added that flood waters can be dangerously contaminated. Certain medical conditions make one vulnerable to airborne mold. “Many materials—wallboard, fabrics themselves (clothes, curtains) and those that trap dust (carpet) are a grand meal for mold,” Schenck has written. “Even some well-constructed buildings that haven’t had moisture concerns in the past become wet from wind-driven rain and flood waters in severe storms.” Schenck wants people to know that any time they see mold, they should consider it an indicator that “moisture is available for biological growth.” The wetter it is, the greater the chances of severe respiratory illnesses. An increase in floods will cause wood and drywall and other building materials to become saturated more often, causing an increase in people’s exposure to airborne mold spores, since that is how they reproduce. This means that people whose immune systems have been weakened by disease are more vulnerable to health effects from mold. The most urgent advice about a flooded living space is to get out until the standing water has subsided. “Once it’s flooded, don’t go wading unprotected in that environment,” Schenck said.